In the journey of investing, you get a lot of advice’s such as Start Early, Invest in Mutual Funds, Stay invested for longer terms, Do not invest in Stocks. Not every piece of advice is good for you, it completely depends on what you wish to achieve out of your investments. In this phase, you get a lot of technical advice’s also, which you may not have heard before and that’s why they seem to be right for you. But a bad mutual fund advice can lead to your financial failure. 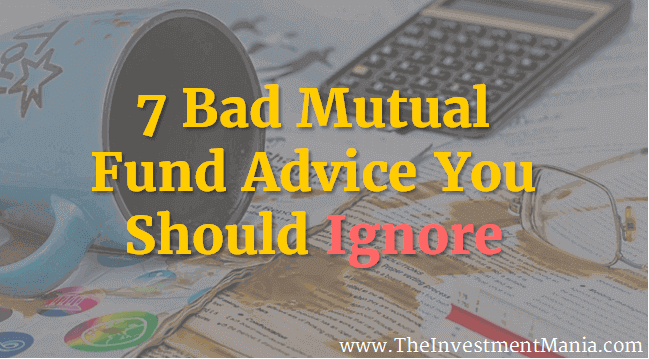 Here we will discuss few of the bad mutual fund advice you should ignore. I have seen a lot of people think that buying a fund with lower NAV will give them better returns than the fund with higher NAV. Investors always get confused with Price and Value (Net Asset Value – NAV) or vice versa. The NAV of a mutual fund is simply a reflection of the value of all stocks in the mutual fund’s portfolio. So higher NAV does not indicate a higher value and a lower NAV does not indicate a poor value. Let’s take an example to see what actually it means. If you want to invest Rs.1000 in 2 different mutual fund schemes, NAV of fund A is 10 & NAV of fund B is 100. In this case fund, A will give you 100 units & fund B will give you only 10 units. Now let’s suppose both funds grow by 10%, the fund NAV for both funds will be respectively Rs. 11 & Rs. 110. If we do math’s, for scheme A you will have 11*100=Rs. 1100, in the same manner, scheme B will give you 110*10=Rs.1100. Final returns of both schemes are same though they had different NAVs. Bottom line: Ignore NAV; it has nothing to do with your returns. The returns will depend on how the fund is performing and not on the absolute NAV value of the mutual fund. Many people get advice to sell mutual funds when fund house declares dividends. The reason they think that they are getting extra money or bonus, unaware that dividends are paid out of their NAV. So basically you are getting what you have invested. So selling funds when fund declares dividends is a big mistake, as you lose very important time of your investment. Mutual funds are basically for wealth building in the long term. You will not get good returns if you opt to sell your funds when dividends are declared. The expense ratio is the fees that Mutual fund AMC (Asset Management Company) charges you as management fees, which they require to run the fund house. A lot of people get paid from your investment. Some funds charge it higher, while some charge less. This ratio determines what you get at the end, so definitely this is a very important factor. But one of the worst advice’s few people give is to go with the fund which has lower expense ratio, not looking at other important factors. A fund with lower expense ratio doesn’t mean that it will give you better returns. Look it in conjunction with other important factors such as the performance of the scheme, portfolio & strategy of the fund. I have seen many people trying to time the market, which sometimes works but fails many times. People stops SIP when the market is rising (generally called as Bull Run) and wait for the times when the market will again fall (which may not always happen). A lot of people have tried this thing and have lost very important investment time of the market. So the lesson is “Do not stop your SIP’s or investments when the market is going up or down”. Just stay invested to get benefits of rupee cost averaging. When the market goes down it spreads fear & many investors feel that they will lose their money in such situation.In these times many people suggest that you should stop investing more money into funds & withdraw whatever they have in their portfolio. But let me tell you the best thing which I have learned over these years & many experts also suggest that “Invest when the market is going down, as you will get same funds with lower value & subsequently get the highest return when markets go up”. People think that getting dividends means their fund is giving them excellent returns or giving an extra bonus. The fact is that Dividend is stripped from fund’s NAV & then given to the investors, resulting in lower NAV of the fund. So actually getting dividend beats the ultimate aim of investing for long term. Choosing Dividend, Dividend Re-investment or Growth option directly depends on the cash flow needs of the investor. Dividend option is better if you are investing for the short term. See my post Growth or Dividend Option – Which One to Choose to learn more about mutual funds options and which one you should choose. Everybody want to get to make the most out of their investments, that said going for the highest return isn’t always a smart approach. Choosing a fund completely depends upon the purpose of your investment, such as some investors want to save tax, someone might not want to take much risk and invest in large caps only. The funds giving highest return may have extreme risks or they might be coming to you with huge fees. So in the nutshell choose fund per your goals & risk appetite. Do not go with the fund suggested by someone. Every financial adviser has different approach and strategy to investing and making money, some of them may give bad mutual fund advice as well. So you should be ready to research on the advice’s you get from them. A bad mutual fund advice can set you up for financial failure. Remember above bad advice and ignore them. Before taking any decision related to your investment, you should study all its aspects and then only take decisions. 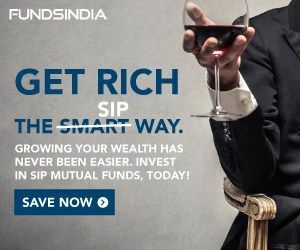 I wish, I would have read these points before 3 years ago…nonetheless its been a learning…everyone must keep above points in mind while investing in mutual funds and IGNORE such advices…thanks for educating Everyone. Great article. Thanks Raman for the appreciation!